This example shows how to model prepayment in MATLAB® using functionality from the Financial Instruments Toolbox™. Specifically, a variation of the Richard and Roll prepayment model is implemented using a two factor Hull-White interest-rate model and a LIBOR Market Model to simulate future interest-rate paths. A mortgage-backed security is priced with both the custom and default prepayment models. Prepayment modeling is crucial to the analysis of mortgage-backed securities (MBS). Prepayments by individual mortgage holders affect both the amount and timing of cash flows -- and for collateralized mortgage obligations (for example, interest-only securities), prepayment can greatly affect the value of the securities. The most basic prepayment model is the Public Securities Association (PSA) model, which assumes a ramp-up phase and then a constant conditional prepayment rate (CPR). 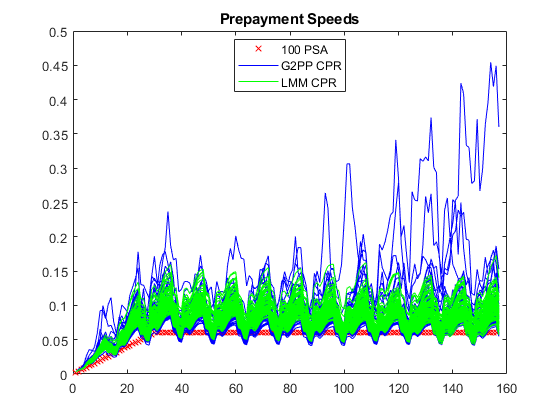 The PSA model can be generated in MATLAB using the Financial Instruments Toolbox function psaspeed2rate. The MBS analyzed in this example matures in 2020 and has the properties outlined in this section. 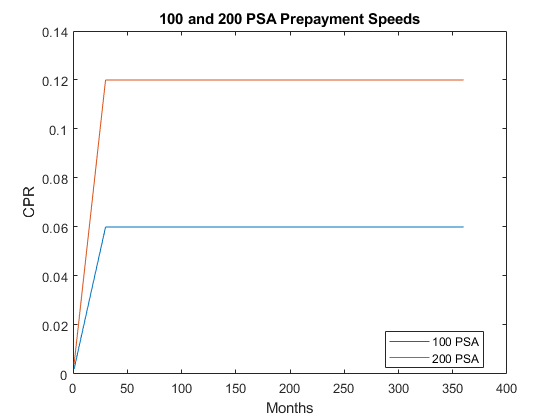 Cash flows are generated for PSA prepayment speeds simply by entering the PSA speed as an input argument. While prepayment modeling often involves complex and sophisticated modeling, often at the loan level, this example uses a slightly modified approach based on the model proposed by Richard and Roll in . For the custom model in this example, the Burnout Multiplier, which describes the tendency of prepayment to slow when a significant number of homeowners have already refinanced, is ignored and the first three terms are used. 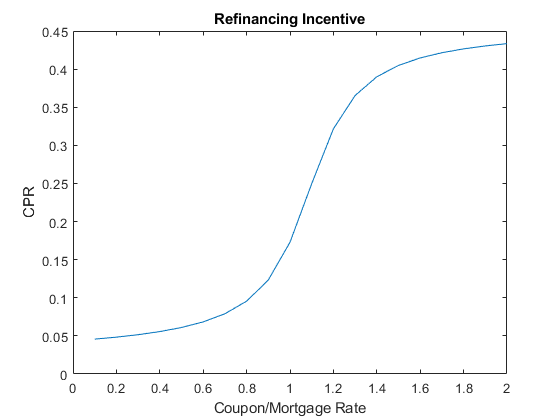 The refinancing incentive requires a simulation of future interest rates. This will be discussed later in this example. 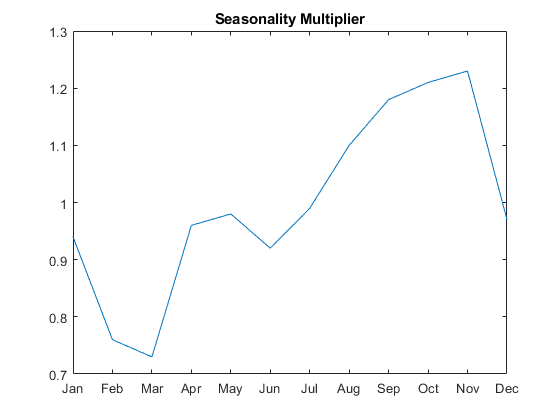 The seasonality multiplier simply models the seasonal behavior of prepayments -- this data is based on Figure 3 of , which applies to the behavior of Ginnie Mae 30-year, single-family MBSs. Since the refinancing incentive requires a simulation of future interest rates, an interest-rate model must be used. One choice is a two-factor additive Gaussian model, referred to as G2++ by Brigo and Mercurio . and is the short rate, and are mean reversion constants and and are volatility constants, and is the market forward rate, or the forward rate observed on the Settle date. Given the above, the choice with the LMM is how to model volatility and correlation. 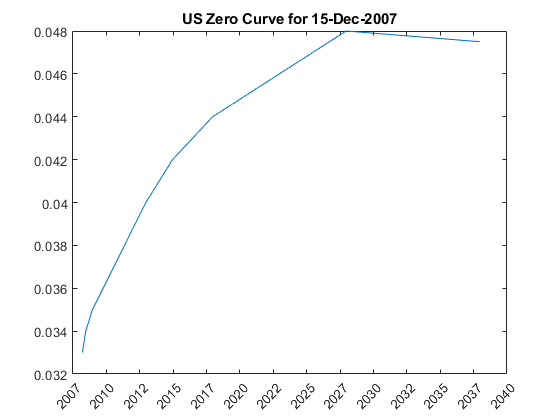 where adjusts the curve to match the volatility for the forward rate. 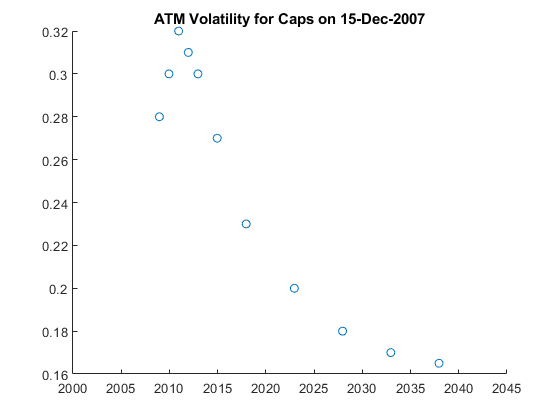 Once the volatility and correlation are specified, the parameters need to be calibrated -- this can be done with historical or market data, typically swaptions or caps/floors. For this example, we simply use reasonable estimates for the correlation and volatility parameters. The parameters in the G2++ model can be calibrated to market data. Typically, the parameters are calibrated to observed interest-rate cap, floor and/or swaption data. For now, market cap data is used for calibration. This data is hardcoded but could be imported into MATLAB with the Database Toolbox™ or Datafeed Toolbox™. % using the |bootstrap| method of |IRDataCurve|. % computes the analytic values for the caps given parameter values. 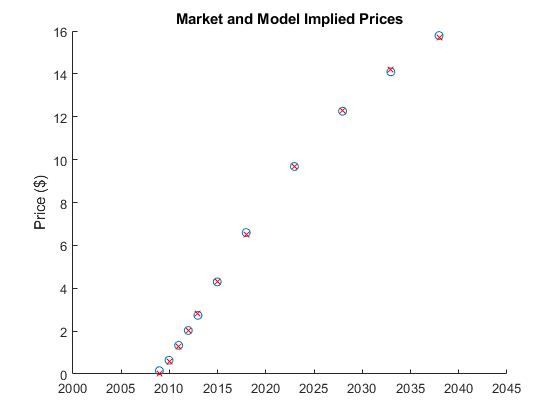 The LinearGaussian2F model can be used to specify the G2++ model and simulate future paths interest rates. After the volatility and correlation have been calibrated, Monte Carlo simulation is used to evolve the rates forward in time. The LiborMarketModel object is used to simulate the forward rates. While factor reduction is often used with the LMM to reduce computational complexity, there is no factor reduction in this example. 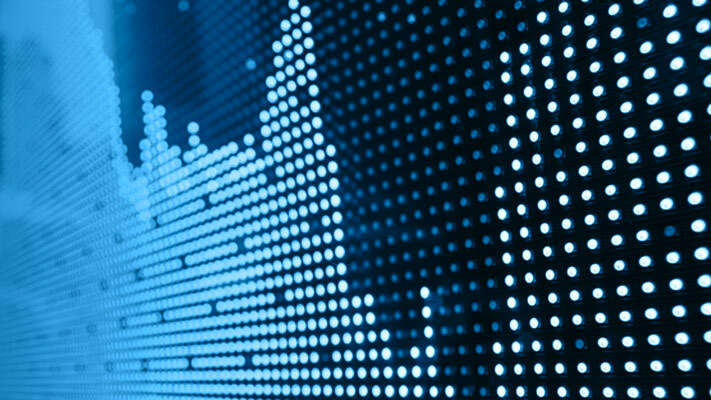 6M LIBOR rates are chosen to be evolved in this simulation. Since a monthly prepayment vector must be computed, interpolation is used to generate the intermediate rates. Simple linear interpolation is used. % representative of a declining volatility over time. The various interest-rate paths can be simulated by calling the simTermStructs method. One limitation to two-factor Gaussian models like this one is that it does permit negative interest rates. This is a concern, particularly in low interest-rate environments. To handle this possibility, any interest-rate paths with negative rates are simply rejected. The various interest-rate paths can be simulated by calling the simTermStructs method of the LiborMarketModel object. Once the interest-rate paths have been simulated, the mortgage rate needs to be computed -- one approach, discussed by , is to compute the mortgage rate from a combination of the 2-year and 10-year rates. Once the Mortgage Rates have been simulated, the CPR can be computed from the multiplicative model for each interest-rate path. With a vector of single monthly mortalities (SMM) computed for each interest-rate path, cash flows for the MBS can be computed and discounted. The results from the different approaches can be compared. 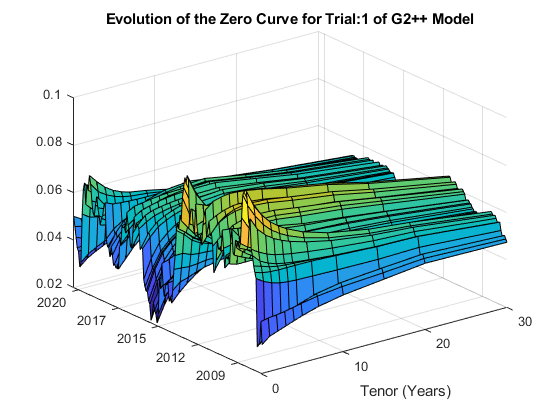 The number of trials for the G2++ model will typically be less than 100 due to the filtering out of any paths that produce negative interest rates. 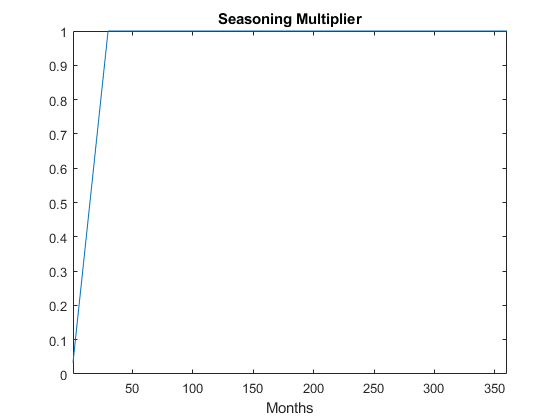 Additionally, while the number of trials for the G2++ model in this example is set to be 100, it is often the case that a larger number of simulations need to be run to produce an accurate valuation. This example shows how to calibrate and simulate a G2++ interest-rate model and how to use the generated interest-rate paths in a prepayment model loosely based on the Richard and Roll model. This example also provides a useful starting point to using the G2++ and LMM interest-rate models in other financial applications. Andersen, L. and V. Piterbarg (2010). Interest Rate Modeling, Atlantic Financial Press. Brigo, D. and F. Mercurio (2001). Interest Rate Models - Theory and Practice with Smile, Inflation and Credit (2nd ed. 2006 ed.). Springer Verlag. ISBN 978-3-540-22149-4. 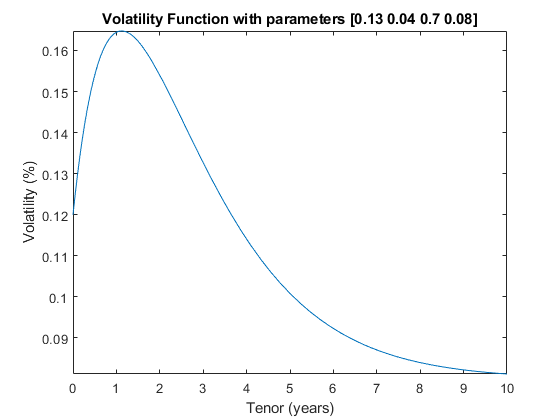 Karpishpan, Y., O. Turel, and A. Hasha, Introducing the Citi LMM Term Structure Model for Mortgages, The Journal of Fixed Income, Volume 20 (2010) 44-58. Rebonato, R., K. McKay, and R. White (2010). 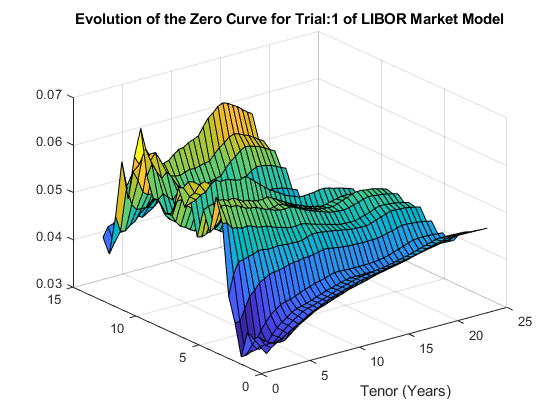 The Sabr/Libor Market Model: Pricing, Calibration and Hedging for Complex Interest-Rate Derivatives. John Wiley & Sons. Richard, S. F., and R. Roll, 1989, "Prepayments on Fixed Rate Mortgage-Backed Securities" ,Journal of Portfolio Management. Office of Thrift Supervision, "Net Portfolio Value Model Manual", March 2000.